After missing last week, I'm back with another Modest Mouse Monday. I'm pushing through the band's back catalog that I've recently added to my collection on vinyl. This week we're up to We Were Dead Before The Ship Even Sank. 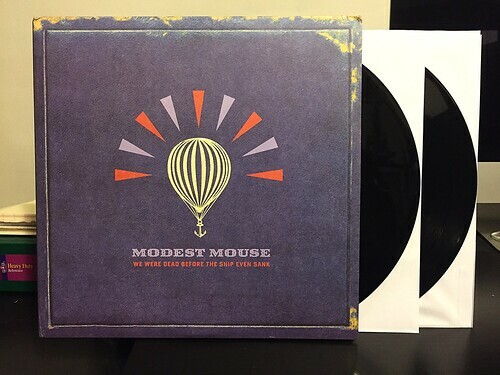 I know a lot of people were disappointed in this record when it came out and I certainly wouldn't rank it as my favorite Modest Mouse album, but I still think it gets more grief than it deserves. Three of the first four songs really kick off this album strong as I think you can put "March Into The Sea," "Dashboard" or "Florida" up against almost any later era Modest Mouse song and do just fine. I'll admit that this album does suffer slightly from something that plagues all Modest Mouse albums; it's a little longer than it needs to be. I always think cutting out two to four songs from any of their records would create a tighter and more focused result. That being said, at worst there's a few songs on here that are a little boring, but nothing that's outright bad. I've always felt that if you like Modest Mouse, there's no reason not to like this album. I don't see it being the kind that would win over new fans or change the mind of someone that doesn't like the band, but if you already like them, this just another good record for the collection. Especially if you're able to grab it for about ten dollars from a sale on the Best Buy website.